Every year we switch our clocks forward or back for Daylight Savings Time. Do you know why? Perhaps you’re like many Americans who believe that daylight saving time was adopted to provide more time for farmers to work in the field. Would you be surprised to learn that this isn’t true? The agriculture industry actually opposes daylight saving time as their schedule is dictated by the sun and not by the clock. The origins of daylight saving time goes back to over 100 years ago. It was first adopted by Germany in 1916 in order to conserve electricity during wartime. The US adopted daylight savings time in 1918 for similar reasons. Refrigerator coils/gaskets: Cleaning your refrigerator coils is one way to save some money. When the coils are dirty, they have to work hard which in turn makes your refrigerator less efficient. The same goes for cleaning and repairing the gaskets. Deep Clean Washer and Dishwasher: If you’ve noticed a mildew smell in your appliances, using a cleaner tablet like Affresh for your dishwasher and washer not only kills bacteria but also removes residue that causes bacteria to grow. Make sure to check your manual to see what the manufacturer recommends. Clean the dryer vents: We can’t stress this enough. It’s not just a matter of safety, but it also helps dry your clothes faster, keeps your dryer working efficiently and helps your dryer last longer. Check the batteries: This is a great time to change the batteries in your smoke alarms and other devices. Make sure to test your smoke alarms once a year and replace them if they are over 10 years old, as recommended by The National Fire Protection Association. Want to learn more about daylight saving time? Check out this link. PDQ Repair wants to hear from you. Let us know what you’ll be checking with the hashtag #PDQcares, or by leaving us a comment on Facebook. You’ve heard that you need to clean the dryer lint trap after every load, but is it true? Why Do You Clean a Dryer Lint Filter? Higher Energy Bills. If the screen is clogged with a thick layer of lint, the dryer has to work harder to dry the clothes which in turns leads to higher energy bills. Cleaning the dryer lint from the screen allows more air to flow out into the exhaust vent and equally allow for efficient operation. Longer Drying Times. Proper airflow is needed to dry your clothes in a single cycle. If you have to continually add time to each dry cycle because you’re clothes are still damp, it might be because your lint screen is clogged. Risk of Fire. Clogged lint screen can lead to dryer fires. Dryers generate a lot of heat, and at high temperatures. And lint is highly flammable. Replace or Repair Quicker. Any time you can help a machine work at it’s highest effieciency, the more you decrease overall wear and tear. This reduces the need for emergency repairs and helps the appliance last longer. How Often Do You Clean a Lint Filter? It’s true! You should clean the lint filter between every batch of clothes. A good habit is to remove lint from the screen either before or after every load. Some of the new dryers will even automatically remind you to check the lint filter before starting your next load. But if it doesn’t, using a dry erase marker works as a great reminder aid. Simply write yourself a note on the door or top of your dryer. Post-it’s work, too! Just inside the door. Open the dryer door and peek inside. If the lint screen is located here, you might see a small raised handle or a screen in the shape of a shallow channel. You may be able to simply scoop lint out of the channel with your finger, or you can pull up on the handle to remove lint from the trap. On the dryers back wall. Open the dryer door and look at the back wall for an oblong cutout with holes in it. Insert a finger and thumb into the holes and pull the lint trap from the wall. Squeeze the sides to open it and you can clean the lint out. On the top of the dryer: This one should be easy to spot right near where the controls are located. You should see a handle you can pull on to removed the lint screen from it’s channel and remove the lint. Dryer sheets and fabric softeners can leave behind a gunky reside that you may need to remove from your lint screen. If you notice that your lint screen is in need of a gentle cleaning, soak it in hot water. You’ll want to make sure you use a little bit of dish washing soap that is designed to remove grease and oil. Gently scrub the screen with a soft brush, rinse and let air dry before reinserting it into the slot. Why Hire a Professional Appliance Company? Have you tried all the tips and tricks listed above and your clothes are still not drying properly? You might have a more serious issue. At PDQ Repair, our qualified experts would be more than happy to help you diagnose the problem. We’re upfront about our pricing so you know exactly what you’re getting. Call us today to schedule your appointment. Back-to-school time is here, and while buying school supplies is probably top of your to-do list it might also be time to consider whether you should upgrade your refrigerator as well. Why? Because a well-organized refrigerator can help lower stress, contribute to a smoothly running family, and help kick-start your families school year in the right direction. An organized refrigerator starts with a clean one. 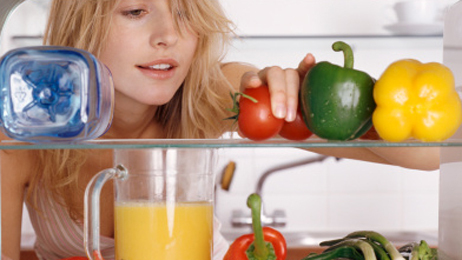 Discard all food from the refrigerator which will allow you to clean all the corners and crevices. Remove any fridge drawers or shelves and soak in warm water mixed with dishwashing soap. Use a mixture of warm water and dishwashing liquid to wipe the interior. Clean the rubber gasket on the door with diluted bleach or vinegar, and be sure to pat it dry. Always keep like items in the same designated area. This will help your family find them quickly and cut down on energy-wasting open-door time. (“Like items” can mean similar things like dairy products or functionally related items like sandwich ingredients.) Consider your family’s unique needs to decide how best to group your groceries, and then stick to your system. If you choose (like most people) to store condiments in the door, don’t feel like you have to keep all of them there. Designate a back corner of a regular shelf to house some of your less frequently used accompaniments. Your fridge will not only look more organized without so many small jars and bottles right out front. You’ll also gain some prime real estate to store other, more frequently used items. Even the best-organized refrigerator requires a periodic purge. Do a quick once-a-week clean-out on garbage day to get rid of any questionable leftovers or produce. Send it straight from the fridge to the garbage bin. This will help keep it from stinking up your kitchen. Don’t let clumsy DIY solutions complicate your life and clutter your refrigerator. Spend the time up front to consider your family’s needs. But if your refrigerator has not been running like it should we can help with that too! Our licensed technicians at PDQ Repair will make sure your refrigerator is running at its peak so you can worry about other things. The above content is provided for information purposes only. All information included herein is subject to change without notice. PDQ Repair is not responsible for any direct or indirect damages, arising from or related to use or reliance of the above content. First came incandescent bulbs, then compact fluorescents, and now thanks to LED (light-emitting diode) technology, the light bulb has evolved again, and is better than ever. Combining low energy consumption and incredible longevity with the appeal of inviting, natural light—LED light bulbs represent the next generation in lighting. Find just the right lighting for your home with our guide to buying new LED light bulbs and discover the benefits of advanced technology that provides a warm, inviting light, plus exceptional value and safety in every room of your home. The LED light bulb is a small digital light source that is illuminated when electrons move through a semiconductor. A digital chip inside the bulb converts tiny amounts of energy into light that is warm and inviting, while the bulb itself remains safely cool to the touch, uses very little energy and lasts for years—at least 10 years with average use*, meaning LED bulbs will more than pay for themselves over time. 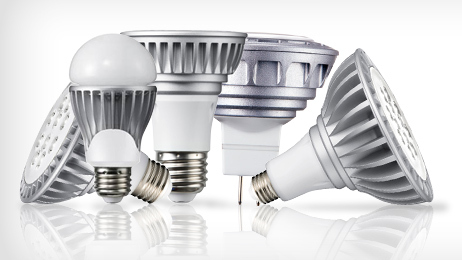 LED bulbs emit no harmful UV or infrared rays and use 85% less energy than traditional incandescent bulbs**. In fact, just one LED light bulb lasts as long as 5 CFLs or 40 incandescent bulbs**, which means lower energy bills, fewer light bulbs to buy and change, and a reduced carbon footprint for your entire home. LED light bulbs provide an enhanced lighting experience, generating true-to-nature tones and warm light that brings out the best in your home. Whether you need clear, radiant light in the kitchen, soft illumination in the bedroom, or cozy, inviting light in the family room, providing just the light you need. Unlike compact fluorescent bulbs (CFLs) LED bulbs reach full brightness instantly, and are dimmable to the softest levels with absolutely no flickering or annoying buzz. Plus, they fit all of the lamps and fixtures you already have in your home, so you can switch over to LED bulbs right away. Lumens: You’re probably used to choosing light bulbs based on watts, but lumens measure the amount of light emitted from the light bulb. A traditional 60-watt incandescent produces about 800 lumens, while a 100-watt generates approximately 1,600 lumens of brightness, so those are the numbers you’ll want to look for. Color: Color is another important factor in choosing the right light. A light bulb’s CRI (Color Rendering Index) gives you an idea of how accurate a light source renders color. Natural sunlight has a CRI of 100, while a CRI around 80 is best for indoor lighting in a wide variety of applications. Another measurement of color is correlated color temperature (CCT) and is measured in degrees Kelvin (K). 2700K is a warm color temperature and matches what you are used to with an incandescent bulb. Look for color temperatures in the 4000K– 5000K range in rooms where you want the clearest, whitest light; while a CCT of 2700K will produce a softer, more yellow glow. ENERGY STAR rating – if a bulb is an ENERGY STAR-certified LED bulb, it has been tested for color quality, light output, and efficacy. If you’re dipping your toe in the LED pond, you might want to consider starting with a hard-to-reach but out-of-the-way spot. You can get a feel for the brightness and temperature, but you’ll also be glad you won’t have to change the bulb for the next couple of decades. No matter the subject when I need advice on something the first place I go is to my dad. Not only is my dad the wisest person I know, he is also the most caring person I know. My father has had an incredible impact on my life and on the lives of so many others. As the owner of PDQ Repair Services, my dad never saw the company as more than just him (as the tech) and my mom (as the bookkeeper). But because of his great leadership, compassionate heart, and logical mind he helped make PDQ the leading appliance servicer in Clark County with 9 technicians and 7 office staff. No matter what the object, my dad taught me the importance of taking care of the things I own. Maybe it was because my dad saw how the electronics industry had changed over the years; from something only a few could afford to being so inexpensive, it was cheaper to replace than repair. Maybe it’s just good common sense. Whatever the reason, my dad saw the value of taking care of the things you own. That means washing the inside and outside of machines, regular oil changes in vehicles, and everything else in between. And if it’s not something I can do myself, I make sure to hire the right professionals for the job. In the end, maintenance is always cheaper than a repair bill (or buying a new one). I can still remember my dad getting so angry when we went through his toolbox and didn’t put his tools back. Or when we used a tool incorrectly and inadvertently damaged it in some way. The thing is, my dad is always prepared. Even in business, he pays attention to common problems and makes sure he has the parts on hand to fix the appliance the first time around. This used to drive my dad crazy, and usually being late was my fault. Later in high school, I was reminded of my dad’s training from an early age when it was impressed on me the importance of being on time. “If you’re early, you’re on time. If you’re on time, your late.” Being on time is a matter of respect and it says a whole lot about you. That’s one of the reasons why my dad works diligently to provide service as quickly as possible, even in some cases, same-day service. I am always one to save a few bucks here and there and try to DIY whatever I can. Unfortunately, when it comes to those expensive HE washing machines I had to concede that making my own laundry soap was not the way to go. One of the most common problems that require repair is using too much soap! It gets stuck to the back of the washing drum and unbalances the machine. While I may be the DIY queen, I also respect that there are some things you just can’t do it yourself. My dad was already reading. My dad was always learning something new. And my dad encouraged education from an early age. I’ve always had a love for school and it’s because of his encouragement. To this day, my dad continues to read and learn. He attends business conferences and sends his technicians to continuing education classes so that they can be the best technicians they can be. Above all else, my dad values family. My mom, my two brothers and my dad and I were a small family growing up. But my dad was always invested in us. He took time out of his busy schedule to always teach us, comfort us and be our mentor. In the same way, my dad invests in those who work for him. When it comes to appliance repair, it’s important to hire a company you can trust. PDQ Repair is proud to be a family-owned business with over 50 years of combined experience. They pride themselves on offering unparalleled appliance service in Clark County. But don’t just take my word for it; check out their reviews, and give them a call today. Appliance repairs often strike at the most inopportune times. Here’s a few quick tips to check before calling PDQ Repair. If these don’t do the trick, PDQ Repair would be happy to service your appliance. Check the Plug – While it may seem silly, this is one of the first things to check when an appliance is not working. Vibrating washers, animals and sometimes even small children can knock plugs out of the wall. Check the Breaker – If the equipment is plugged in, the next place for you to look out would be the central home electrical box and see if the circuit breaker has tripped. If this happens, try resetting the circuit breaker. Check the GFCI – If the circuit breaker hasn’t tripped, look for a GFCI (ground-fault circuit interrupter) which may be upstream from the troubled outlet has tripped. Simply push the reset button on the GFCI and you could be back in business. See if the circuit breaker has tripped and try resetting the circuit breaker. Check the Door and Seals – Many appliances have door locks which check to ensure the doors are properly closed. If the door of the appliance is open they will not operate. Check if the doors are closing properly and nothing is jamming the door. Check the Coils – The coils are the black tube-and-wire grid that cools the fluid in the compressor. They are located by opening the grille at the bottom of the refrigerator or on the back of your fridge. A buildup of hair, dust and other debris can cause the compressor to overheat and trigger the overload switch. Many home centers sell a coil cleaning brush that you can push into the coils, pull back and vacuum clean. Clean the igniter – On your gas range, if the burner won’t light, try cleaning the igniter. Use a toothbrush to clean off food spills from the igniter. On an electronic ignition stove, it’s a little ceramic nub located either on the stovetop or under the ceramic seal strike plate. Also, be sure that the round ceramic seal strike plate is properly seated on the burner. Check for a loose burner – On your electric range, your burner prongs may need a better electrical connection. You should be sure the burner is turned off and pull it out from its socket. Then plug it in again and wiggle it around. If it feels loose, remove the burner again and gently bend the burner prongs slightly outward for a tighter connection. Be very careful not to pry too much as you could end up pushing the whole socket out of its bracket. On your gas range, if the burner won’t light, try cleaning the igniter. Check to see if it’s level – When a washing machine cabinet rocks, it makes a horrible racket during the spin cycle. To adjust the legs on your washing machine, using a level on the top of your washer, screw the front legs up or down until the cabinet is level. When both legs are solid on the floor, tighten each leg’s locking nut. In most washers, to adjust the rear legs, gently tilt the machine forward and gently lower it down. The movement will self-adjust the rear legs. Check For Small Items – Washing machines, dryers, and dishwashers can make strange noises when small things such as coins and plastic get stuck. These items may even jam or cause your appliance to malfunction. Check if there are any such items inside the appliance creating the noise and remove them. Check the settings first – One way to avoid an embarrassing call is to make sure that your dryer is set to the proper settings for what you want to dry. Many service calls can be avoided by checking to see if the dryer is set to “fluff air”—a non-heat setting. Check the Vents – Another common cause of poor drying is a clogged lint filter. Check the vents to see if they are plugged or if dust and dirt has settled on them and blocked them. Clean the filter and float switch – When your dishwasher no longer gets your dishes clean, a food-filled filter is most often to blame. If it’s clogged, water can’t make it to the spray arms to clean the dishes in the top rack. Simply pull out the lower rack and remove the filter cover inside the dishwasher. (Check your owner’s manual if you can’t spot the filter.) Then use a wet vacuum to clean off the screen. While you’re there, slide the nearby float switch up and down. If it’s jammed, you won’t get any water. If the cover sticks, jiggle it up and down and clean it with water. When your dishwasher no longer gets your dishes clean, a food-filled filter is most often to blame. Check Your Manual – All appliance manuals have simple troubleshooting tips. Customers should check these appliance manuals for tips before calling for appliance repair. If all these points stated above fail to yield any results, call us right away. PDQ Repair is your appliance repair specialists in the Portland OR, Vancouver, WA area. Our team of professional appliance repair technicians are fully trained. We can offer you timely and professional service whether you are covered by warranty, or not. Help Mom out this year by giving her a gift that saves her time, money and stress. Here are four easy to do, simple tasks, that will keep the appliances in your home looking and operating like new, and show your mom how much you appreciate her. Why not throw a load of laundry in the wash for your mom? And while you’re at it, take the opportunity to do some simple maintenance on the dryer. Carefully pull it out from the wall and vacuum up any dust balls behind it. When done, switch the laundry to the dryer, and wipe down the washing machine inside and out. Don’t forget about under the lid as well. The microwave is one of the most often used appliances in the home. Take a few minutes to warm up a mug hof hot water and vinegar in the microwave. The steam will help loosen cake-on stains and all you need to do is take a damp cloth to the inside to wipe it down. Have you looked in the refrigerator lately? Take 15 minutes out of your day to pick up inside. Remove any spoiled or rotten food and replace any burned out lights bulbs. Once done give each drawer, shelve and compartment a good soak in the sink while you wipe down the interior. Dry and replace the shelves and food once you’re done. Last, but not least, soak dirty oven racks in a garbage bag with a safe oven cleaning solvent. Use the same cleaner to scrub away grease and other spills from inside the oven. Once complete, put the clean oven racks back in and preheat the oven to cook Mom her favorite treat! Our Mom’s deserve our best, because they give their best to us everyday. Everyone in the family, even the kids, can get behind these easy, and quick maintenance tips to show mom how much we appreciate her. For appliance maintenance tips that can help your appliances stay clean and run efficiently all year round, subscribe to our blog feed. Your first choice for appliance repair in the Northwest! PDQ Repair Services is your 1st choice for appliance repair in the Northwest! We offer same day service when possible, especially when it comes to refrigeration. It’s never convenient when your appliances aren’t working, so it’s our mission to make sure we can get it repaired as quickly as possible. Our friendly local business strives for excellence in all forms of appliance repair. We provide quality repair to all brands of appliances. Not only do we do fantastic repairs on the likes of Whirlpool, Frigidaire, and Electrolux but we are also Clark County’s only factory authorized repair center for Samsung and LG appliances, both in and out of warranty. If your washer, dryer, refrigerator, or other appliance isn’t working right, contact us today! We will send out a technician to quickly and expertly repair your appliance. Learn more by visiting our About Us page! Or contact us today!